Kenlyn celebrated her 9th birthday party at the neighborhood clubhouse. 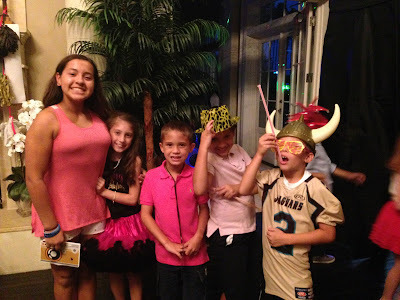 Although both Connor and Paige were invited, it was a dropoff party, and Paige isn't quite old enough for that yet. We dropped Connor off and then went to dinner with Paige. I picked him up close to 10pm and he was pretty tired. I think he had fun, and Clara even said that he'd danced a little with his friends. She texted Andrea a picture of Connor with Sofia, Kenlyn, Danny and Trevor.